Tuesday 14th November 2017 - The Battle of Barnet Project – Sam Wilson. All the lectures are held at Stephens House & Gardens (formerly Avenue House), 17 East End Road, N3 3QE, starting at 8pm, with tea/coffee & biscuits afterwards. Non-members are welcome (£1.00). Buses 125, 143, 326 & 460 pass nearby. Finchley Central Underground Station (Northern Line) is a short walk away. Official Papers for this year’s AGM at Avenue House are with this newsletter. The AGM is your opportunity to show your support for your Society, and for the Officers and Committee. It gives you a chance to hear about our various activities and meet some of those involved. It would be very encouraging to meet some of those who do not usually attend our monthly lectures, or join our annual 5-day trip. Perhaps you are able to assist by joining the committee, or with some of our activities? For example, for the last two years, we have had nobody prepared to organise any one-day outings, so they have not happened. If you feel you can help in any way, please contact me (see details on last page). Or perhaps you would like to join in more of what we do. In recent years, we have followed the AGM meeting with a well-received Presidential presentation, and this year, we are hearing about the dig which took place at Lant Street, Southwark in 1999, finds from which are now being studied and recorded by our Wednesday evening Finds Group led by Jacqui Pearce. The original dig was run by our President, Harvey Sheldon, and Harvey and Jacqui will give us the background to the dig and our current work on it. This is an opportunity to hear more about one of the activities undertaken by a group of our members. We will be starting the AGM at 7:30 p.m.
Next Lecture: Introduction The Cheapside Hoard: London’s Lost Jewels. In 1912 labourers on a building site in Cheapside in the City of London unearthed a great treasure of gemstones and jewels which had lain undisturbed for some 300 years. Now known and celebrated as the Cheapside Hoard, it is the largest cache of its kind in the world and remains the single most important source of our knowledge of the Elizabethan and early Stuart jewellers’ trade. With emeralds from Colombia, sapphires from Sri Lanka, diamonds and rubies from India, glistening pearls from the Middle East, and opals from Hungary, the priceless collection of nearly 500 pieces provides unparalleled information on London’s role in the international gem trade in an age of global conquest and exploration. This talk will consider why the Hoard is important and what it contains: why it was hidden, and why it was never reclaimed. Hazel Forsyth is the Senior Curator of the Medieval and Post-Medieval Collections at the Museum of London. She is a Fellow of the Society of Antiquaries; a Fellow of the Royal Society of Arts; a Freeman of the City of London; a Liveryman of the Worshipful Company of Goldsmiths' and a Liveryman of the Worshipful Company of Pewterers'. She has worked on numerous exhibitions in this country and abroad and has published widely on a range of subjects. Her most recent books include: London’s Lost Jewels: The Cheapside Hoard (2013) and, Butcher, Baker and Candlestick: surviving the Great Fire of London, (2016) which was published to coincide with the 350th anniversary of the Great Fire of London. She is currently working on a major catalogue of the Museum of London’s pewter collection, the largest in the public domain. In conjunction with UCL, HADAS has been approached to come back and do another excavation at Hendon School with a likely date from the 12th June 2017 for two weeks. However, the date has not been firmly fixed yet and we are waiting for the school to come back to us. One need would be to get DBS (Disclosure & Barring Service) clearance for some or all of our diggers so it would be helpful if you could tell Bill Bass (bill_bass@yahoo.com) or Don Cooper (details back page)I if you want to take part. We are very keen to have more editors for the monthly HADAS Newsletters. Basically, being an editor for a month, just once a year – or more if you are willing - entails collating incoming items sent in, most already typed up, setting them into a framework of an 8 or 12 page publication and adding your own interesting and relevant items if you want. We can offer plentiful guidance to get you started. E-mail me (mary.rawitzer@talktalk.net), or phone 020 8340 7434 to talk about it. Reflections and Agendas' from 10.30am – 6.00pm at the UCL Institute of Archaeology, Room 612. The workshop is envisaged as a wide-ranging inaugural event in a series which will, in due course, look in more detail at specific themes. Three thematic sessions are planned, the aim of which is to have 3 or 4 short and informal presentations, followed by extensive discussion time. The event is free; refreshments, lunch and a post-workshop drinks reception will be provided. Places are limited, so please RSVP via Eventbrite to indicate your interest in attending. This event is designed for prospective students, teachers and parents to learn about the many degree programmes on offer across the UK, to discover the huge range of career opportunities that an archaeology degree can lead to, and to hear about some of the latest archaeological research. Many of the top archaeology departments will be represented, along with a range of organisations that promote the subject and employ archaeology graduates. There will also be a full programme of talks and activities covering application tips, careers advice, and a wide range of archaeological topics including some of the latest finds and cutting-edge research. As a very broad subject that combines arts, humanities and sciences archaeology is great for developing a mixture of academic and practical skills, the University Archaeology Day offers help to find out what an archaeology degree can do. The event is free but registration is essential. Register via Eventbrite. Dr Helen Fry’s talk was not only informative but hugely entertaining and often surprising. Trent Park and, later on, Wilton Park near Beaconsfield (now demolished) and Latimer House at Chalfont & Latimer were used to house enemy officers and men from the German and Italian armed services. Apparently, the spy George Blake worked here for a time. The conditions were comfortable and the PoWs felt sufficiently relaxed to talk openly about many matters of interest to the intelligence service including the latest technology, German (or Italian) morale and even arguments between the army and the SS. The effect of the information was to shorten the war by at least two years. While the story of Bletchley has been in the public domain for some time, that of Trent Park has only been known since 1999. The story starts with Thomas Joseph Kendrick, a spymaster who worked in Vienna for MI6. He was able to move in diplomatic circles and was engaged in visa work as well as in tracking weaponry. Apparently Kendrick met Kim Philby during his time in Vienna. In 1938 Hitler annexed Austria. Kendrick managed to arrange visas for some 200 Jews a day until he was betrayed by a double agent. Following interrogation he was released and made it back to London. Dr Fry reckons that Kendrick had a lucky escape, going on to play a crucial role in World War II. By 1938 British Intelligence was already preparing for the expected war with Germany. Hugh Sinclair, Head of the British Intelligence Service (MI6, later MI19), had already bought Bletchley Park and was planning a further most secret unit in which the conversations of Nazi PoWs could be bugged. Sinclair decided that Kendrick was just the person to run the operation together with two representatives from each of the armed services. This was the first time that the three armed services, used to acting independently, came together in an inter-services intelligence unit – CSDIC (Combined Services Detailed Interrogation Centre). The first such camp was actually the Tower of London – specifically the Salt Tower. Rudolf Hesse, Hitler’s deputy, who had flown to Britain, was also brought to the Tower, lodging in the Queen’s House before being moved to Mychett Place near Aldershot. By 1939 there were over 60 PoWs. These had been subjected to fake interrogations designed to promote the idea that he British were completely incompetent in these matters. PoWs consequently reduced their guard, despite warnings from their own side, and talked openly of the information which they had withheld. It was in the Tower that the first conversations were heard about a secret weapon. So much importance was attached to the gathering of intelligence and such was the volume of information coming through that Trent Park was purchased, the owner, Sir Philip Sassoon, having died in 1939. Trent Park was reserved for the highest-ranking officers and their lives were made extremely comfortable – as, several of them thought, befitted their ranks. They were greeted on arrival by “Lord Aberfeldy”, “cousin to the King”. He got to know the German officers, attended to all their needs and even allowed them a tuckshop, financed by MI19. They enjoyed excursions to London, carefully avoiding bomb-damaged areas, and enjoying lunch at Simpson’s in the Strand (the staff were all changed, of course). By 1942-3 some very technical language was being heard, as well as some difficult dialects. Many refugees from Nazi Germany came to Britain and some 10,000 enlisted in the forces, often drafted into the Pioneer Corps as unskilled labour. Eventually more than 80 of these refugees were drafted in by the Intelligence Service to listen in to the conversations of PoWs. Their fluency in German was invaluable. By 1943 the listening units numbered one thousand staff and one hundred secret listeners. Two of these listeners have survived into their 90s and Dr Fry spoke about one in particular, Fritz Lustig. A more detailed account can be read in her book: “The M Room: Secret Listeners who Bugged the Nazis”. As expected, PoWs tended to talk openly to their cellmates about what had happened at their “interrogation” and what they had concealed. The listeners needed to be very skilled, not only in German but also in the details of the three services, the ranks and the weaponry. Complete recordings were made with transcripts written in the original German and in English translation. The information gained from the M Room provided extensive knowledge of German technological advances, especially in the Luftwaffe. By December 1940, 685 German airmen had been captured. More than one thousand reports were compiled and thus the listeners became familiar with the technology on board enemy aircraft. This included Knickebein (“crooked leg”), X-Gerät and Y- Gerät (X/Y system), devices for informing a pilot when he was close to the centre line of a runway and also to alert him when he was over a target. The task was therefore to jam the signals in order to confuse the pilots. Further listening kept the British abreast of new developments, notably the Focke-Wulf fighter/dive-bomber, as well as the fighting formations to be used. Naval intelligence included details of U-boat numbers, movements and losses. There was also information on German battleship plans and the development of a magnetic torpedo. Army intelligence became more important in 1942 after the British campaigns in North Africa. Information was gathered on the size and type of bombs, but PoWs had doubts that bombing alone would win the war. Listeners also picked up conversations about the possible invasion of Britain and the later talk that suggested that the plan would be postponed. PoWs also discussed the use of nerve gas, but seemed to agree that it would not be used against Britain unless she used it first. Listeners picked up on the apparent friction between the SS and the German army and British Intelligence noted that even in the ranks of the Nazi Party opinion was divided. All this came to a climax in April 1944 when plans were afoot among the PoWs for a celebration of Hitler’s Birthday. By now, opinions of the Führer were sharply divided. Interesting conversations were recorded about politics, etiquette and whether the war could still be won. Into this excitable mix PoWs revealed plans for the rocket programme, the V1, V2 and V3. The launching site was duly bombed on a moonlight raid on Peenemünde on the 17th-18th August 1943. The aircrew were not told of the full significance of their mission. Subsequent conversations revealed the location of other launch sites which were bombed before they could be completed. Col Kendrick continued doing important work for MI6 after the war. No-one knows what that was. He retired in 1948 and was awarded the OBE. Again, no-one knows precisely why. He died in 1972 at the age of 91. Dr Fry ends Chapter 11 of her book with a quotation from Norman Crockett, who wrote to Col Kendrick: “You have done a Herculean task and I doubt if anyone else could have carried it through. It would be an impertinence were I to thank you for your contribution to the war effort up to date: a grateful country ought to do that, but I don’t suppose they will”. Trent Park was as important as Bletchley and it is hoped that, despite plans for a development of apartments, the ground floor will become a museum. It is, after all, a site of international significance. Footnote: People who have read “The M Room” might also like to read (if they haven’t already) “Most Secret War: British Scientific Intelligence 1939-1945” by EV Jones. There are references to Cockfosters and to X/Y Gerät. We have been asked to publicise a Diploma in Irish Archaeology offered By the National University of Ireland, Galway (NUIG). This is fully online, to facilitate the participation of folks who cannot travel to Galway and those in different countries and time zones, and is offered by experts on Irish archaeology. There are participants from all over Ireland, the United Kingdom, Spain, Germany, Canada, the United States, and Australia. Information can be found at:http://www.nuigalway.ie/courses/adult-and-continuing-educationcourses/irisharchaeologyonlinediploma/ and online applications at http://www.nuigalway.ie/adultlearning/how-to-apply/online-applications/ . 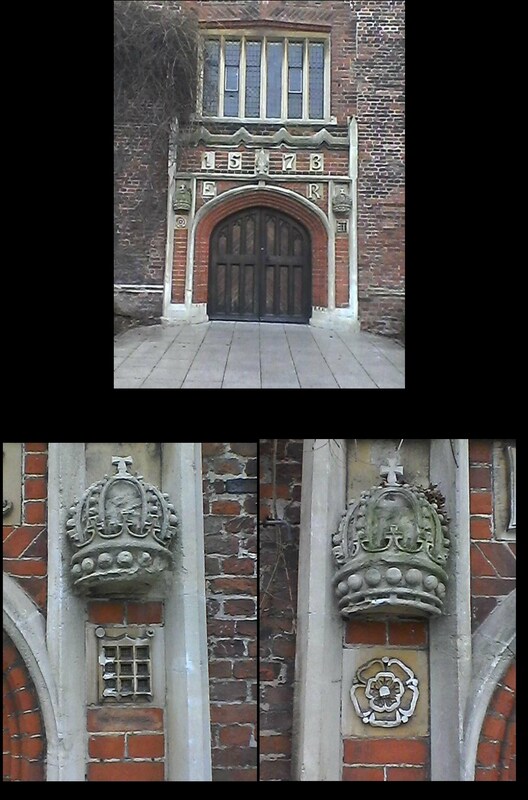 The Tudor Hall at Barnet and Southgate College has this wonderful Elizabethan doorway dated 1573, with a crown on each side. One is above a Tudor Rose, while the other is above a portcullis, a symbol associated with Westminster. However, neither crown looks anything like the one which crowned our present Queen Elizabeth. It seems that back in the 17th century not only was Oliver Cromwell’s Republic short of money, but to Cromwell the old crown jewels represented “the detestable rule of kings.” Trustees valued and sold the crown jewels to the highest bidder. 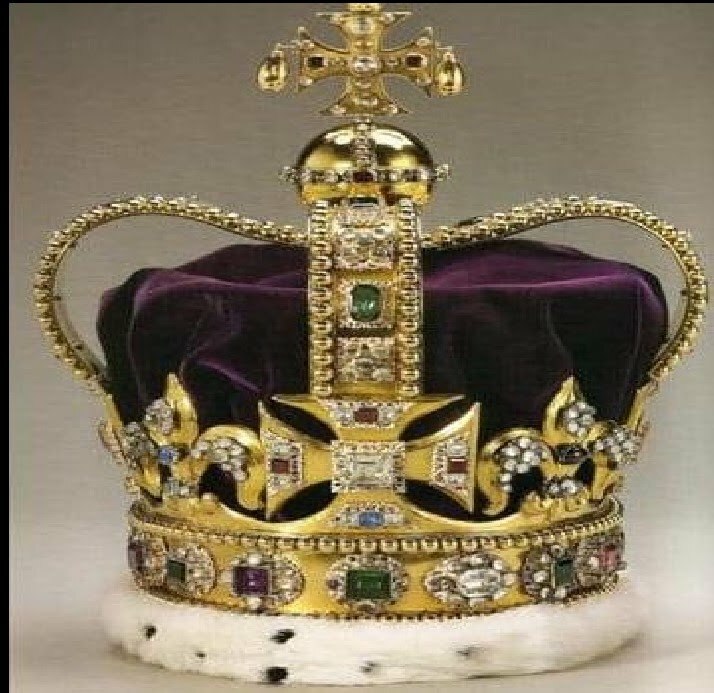 The crown itself, which dated back to the reign of King Henry VIII, was valued then at £1,000, but it was stripped of its gems and the rest melted down for coins by the Royal Mint. The present King Edward’s Crown (right) was made for the Coronation of King Charles II in 1661. Thurs 11th May 6.30 for 7pm. London Archaeologist Annual Lecture: Expect the Unexpected: Fenchurch St from the 1st Century to the First World War Neil Hawkins, PCE. Drink reception followed by AGM and lecture. All are welcome, free, but please RSVP via email for the reception and to identify the location! Sat 13th May, 10.30am-5.30pm. Docklands History Group 6th Annual Conference: Thames River Crossings. Museum of London Docklands No. 1 Warehouse, West India Quay, Hertsmere Rd, Canary Wharf, E14 4AL. For information and booking: www.docklandshistorygrouop.org.uk . Wed 7th June, 6pm. Docklands History Group (see 15th May above): Oars Oars, Sculls sculls: Constructing the Thames Waterman in the Eighteenth Century. Talk, Hannah Melissa Stockton. Visitors £2. Wed 7th June, 6pm. Gresham College: Fifty Year of Conservation Areas. Talks by Prof Simon Thurley & Desmond FitzPatrick (Chair, City Heritage Society). Museum of London, 150 London Wall, EC2Y 5HN. Free. Fri 9th June, 7.45pm. Enfield Archaeological Society: Liquid Assets: Interpreting the prehistoric finds from the Thames. Talk by John Corron, EAS Vice-President. (Location as Enfield Soc, 8th June above).Visitors £1. Refreshments, sales & info from 7.30pm. Monday 12th June, 3pm. Barnet Museum & Local History Society: The 100th Anniversary of the Battle of Vimy Ridge. Talk by William Franklin. Visitors £2. Wed 14th June, 7.45pm. Hornsey Historical Society: The Customs and Traditions of the City of London. Talk by Mark Lewis. Union Church Hall, crnr Ferme Park Rd/Weston Park, N8 9PX. Visitos £2, Refreshments, sales, info from 7.30pm. Friday 16th June, 7.30pm. Wembley History Society: Harry Beck’s Underground Map. Talk by Lester Hillman. English Martyr’s Hall, Chalkhill Rd, Wembley HA9 9EW. Visitors £3, refreshments 50p. NW7 4AN by May 19th (e-mail haynes.julia@yahoo.co.uk, phone 020 8906 0563). Wed 21st June, 7.30pm. Islington Archaeological & History Society (see May 17th above). 500 Years of Richard Cloudesley’s Charity. Talk, preceded by AGM at 6.30pm. Wed 21st June, 7.45pm. Friern Barnet & District Local History Society: The Shelter of the Tubes during the Blitz. Talk by Alan Williams. Noreth Middlesex Golf Club, The Manor House, Friern Barnet Lane, N20 0NL. Visitors £2. Refreshments and bar. Sat June 24th. Barnet Physic Well is open again – see 20th May, above. Sun 25th June, 11am-5pm. Markfield Beam Engine & Museum: Steam open day. Markfield Park, Markfield Rd, N15 4RB. Free admission. Also open 2nd Sun. of the month & Bank Holidays. Thurs 29th June, 8pm. Finchley Society: Annual General Meeting. Drawing Room, Avenue House (Stephens House). Visitors £2. Refreshments 7.30 pm and afterwards.